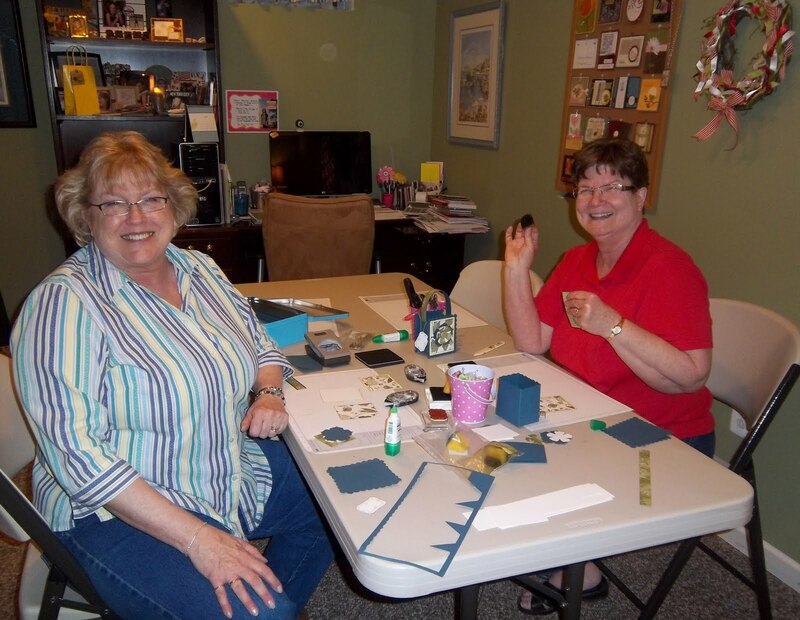 Trinity Designs: A Little Help from My "Fools"! This post is a bit wordy, but it's a wonderful story and I hope you'll read through and experience it with me again. It's a cool, but beautiful day here in Virginia - the sun is shining and I've enjoyed a nice walk with Mark and the fuzzy babies this morning. Yes, each day is getting better and I'm feeling brighter. More able to function and get on with things. That is my praise to the Lord today! 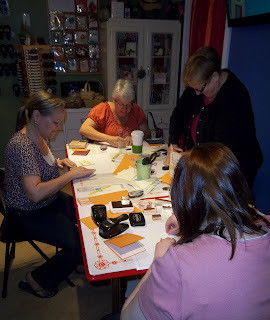 I'm also thankful for a very special group of ladies - self described as the "Stampin' Fools". 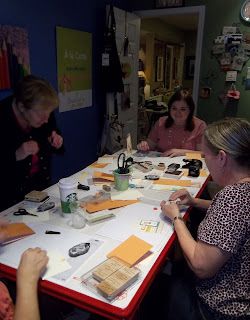 These gals comprise one of my party groups and meet here in the studio once a month to stamp, laugh, eat, laugh, cause trouble and laugh some more. I LOVE these ladies so much! Very special people and I don't think they are at all foolish! The week of my Dad's funeral was their normal stamping week and I insisted that they come over as usual. A bit selfish on my part - I 'needed' something normal, something to focus on besides my grief and I knew their presence in my home would bring me up like nothing else. So, knowing that I had to prepare projects for them and a gift for Laura, the hostess, I went into the studio to get started. Problem was, I just couldn't. I sat and stared at my table and just couldn't even think. Well, about the time I was ready to give up and call them to cancel, my phone rang. It was Georgia Giguere, one of my dear friends on this year's Advisory Board. She was calling to check on me and I'm convinced that God whispered in her ear that I needed a friend just then. I poured out my heart to her and we talked, cried and prayed. She blessed me so much that day and gave me what I needed to simply get on with it. And bless her soul - she even sent me an idea for a project that I turned into the gift for Laura, my hostess. 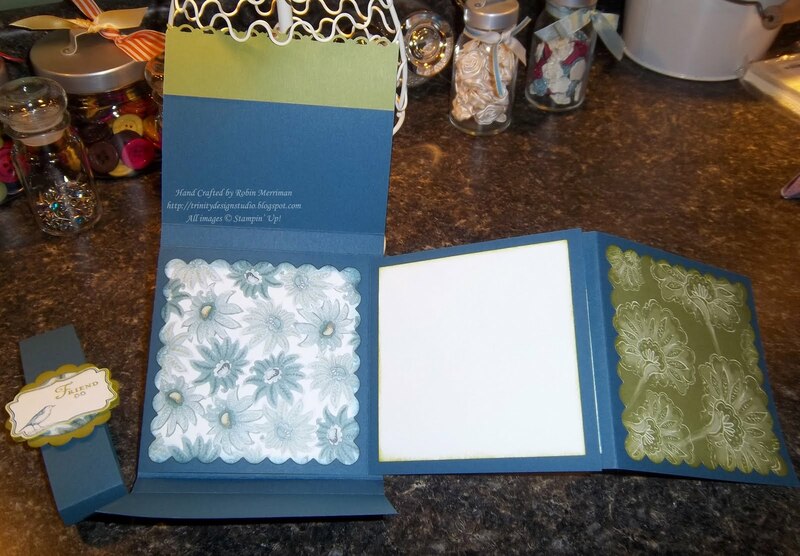 It's a Mini-Scrapbook Album all folded up in a neat little square! I think the original idea came from the very talented Kim Assaly from Canada, but Georgia was kind enough to send me the directions. The 'belly-band' slips off to reveal pages that fold in on itself. 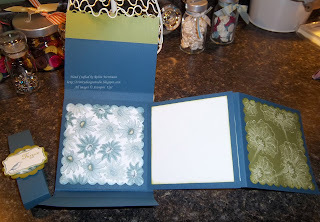 I kept it pretty simple but I did do some sponging on the cardstock and the Designer Paper. 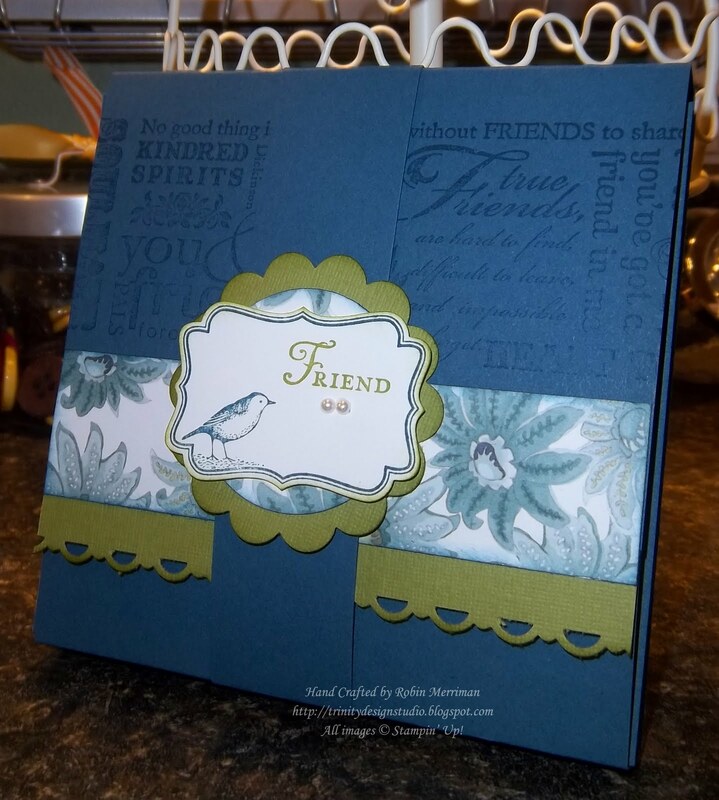 The supplies - Stamp set, designer paper were from the Sneak Peek last month for items coming out in the new Catalog in July. 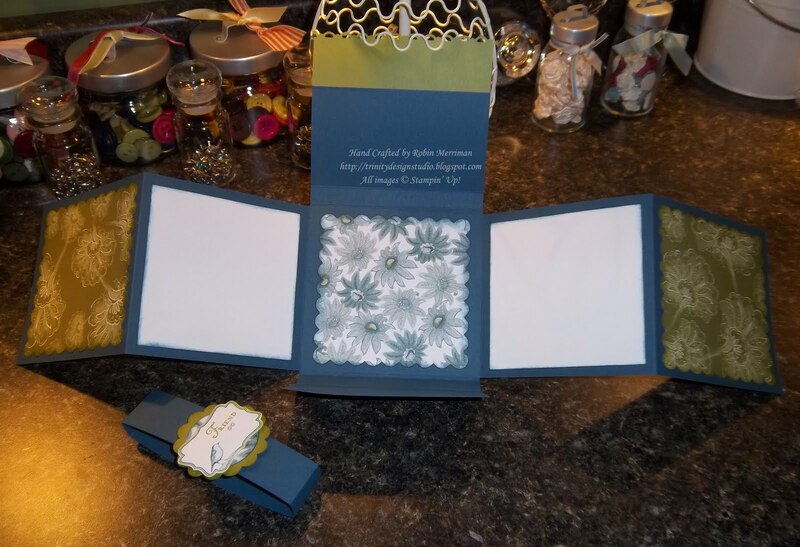 The Four Frames stamp set and Paisley Petals designer paper. I did wheel across the front with the Friendly Words Jumbo Wheel and the "friend" word is from the You're a Gem stamp set that was in the Occasions Mini. 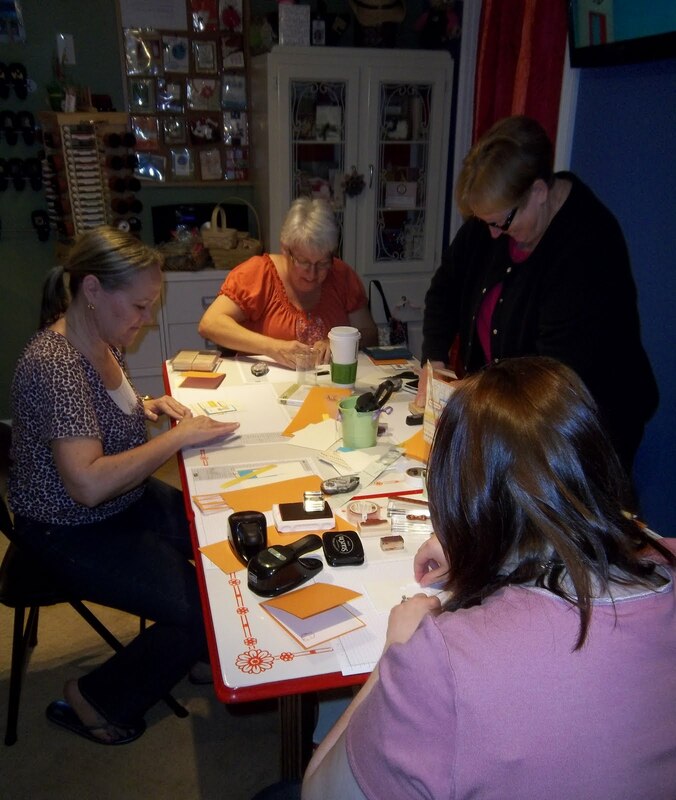 Here are the Stampin' Fools in action in the studio. I'll show you the projects they made later on, ok? April again at the end of the table. Speaking of table - you are getting to see the table that made me do the happy dance on a New York City street! But that's a story for another day! Here are Pat and Pam. They've been friends for over 30 years! I just got word yesterday that Pam's Mother died on Monday so if you would include her in your prayers, that would be wonderful! My heart goes out to her. So, once again, God knew exactly what I needed and sent it just when I needed it most! The relationships I've been blessed with through this simple hobby of stamping are some of the most beautiful ones I have. It's amazing how just a little paper, ink and glitter can bring people together like nothing else. I hope you have been blessed by it too. If not, come join us sometime. Find a local demonstrator or just get together with friends and create from the heart. Laugh together, cry together, just be together. I like all things small and this album is terrific! 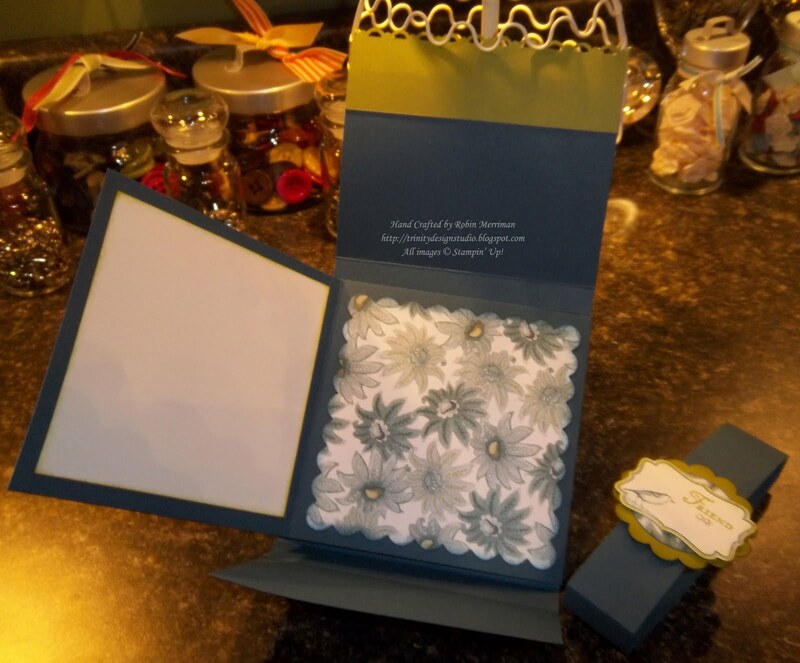 I will try one using photographs from Easter and send it to my daughter. Thanks for sharing. Peg in Kazoo P.S. You did a great job on the video! Totally love this project and will be featuring it on My Crafty Picks #15 with a link back to your blog on 5-8-11. You know the rules, if you want to decline just email me and you have that address!! Miss you and sorry I have not called!! Been so stinkin' busy here it is not even funny!! I am headed out the door of work in a little bit for Evansville. I will try and call you while I am on the road! !